The gong target D300 * 10 is a great option to equip shooting ranges, military grounds, shooting competitions and exercises in the field. The target equipment of Velmet is actively used by the Armed Forces of Ukraine for training the military personnel and it has already received a lot of positive feedback from the domestic and foreign experts. Clear sound effect. During shooting at paper targets, the shooters have to be constantly stopped in order to check the clarity of the hit. The using of steel gongs provides a maximum effectiveness of training, as the sound of metal hitting against metal is clearly hearable from the shooting position. Unique Triplex formula of hardening. Most metallic targets on the market are cut from a material, which has already undergone hardening. Our engineers apply a completely different method. 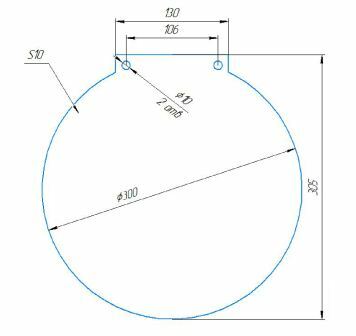 The gong target, which you can buy on Velmet.ua online store, first passes the cutting process, and only after getting the desired shape, goes through hardening. At the same time we have turned the formula of "Triplex" into practice (hard layer ─soft middle ─ hard layer), which allows avoiding the premature failure of target equipment in the conditions of intensive use. Third, flexibility and comfortable mounting. The gong targets of the round shape feature ergonomic shaped lug with holes for fastening with a help of a rubber band. The gong target can be used as a separate component or as a component of the target system. Velmet carries strict quality control over targets, gongs, elements of body armor, tactical equipment standards at all stages of production. To manufacture the products for people as if we do ourselves is a high principle that we follow and we are willing to guarantee the quality of all products. In order to buy gong targets in Ukraine with the possibility of delivery to any region, you can go to our convenient functional online store or contact us by the phone number. We value the trust of our clients and we are always ready to justify it!